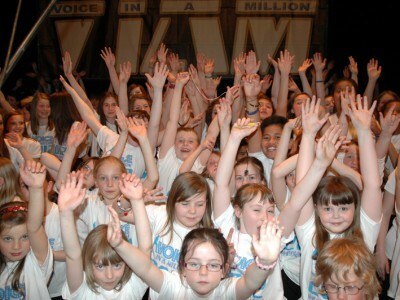 Voice in a Million was set up in 2009; as a promoter of school / singing events, with an under-pinning message that raises awareness of the plight of children in care and the importance of Adoption and Fostering, both in the UK and worldwide. Now celebrating its tenth year, Voice In A Million presents an opportunity of a lifetime for school children from all backgrounds throughout the UK to come together united in song and perform in front of their own family and friends and indeed members of the general public. VIAM fully endorses not just the psychological benefits to children who are actively encouraged to participate in music-based activities, especially singing, but also the health benefits and the intrinsic feeling of belonging that a choir can bring to a child in care. VIAM Events showcase some of the finest young singing talent around whilst enabling school children to participate in a once-in-a-lifetime celebration of singing together in front of thousands. All the children taking part receive tuition, encouragement and support. Individually they are given the chance to shine and join our ever-growing ‘Voice’, knowing that their involvement makes a difference to the lives of children less fortunate than themselves. Through dedication, passion and the voice of our mass choir, Voice In A Million’s message is growing and getting stronger every year. How VIAM inspires with a great sense of fun for all and how our important message is shared. A fantastic and fun learning experience outside the classroom for schoolchildren of all ages. What is involved if we take part ? 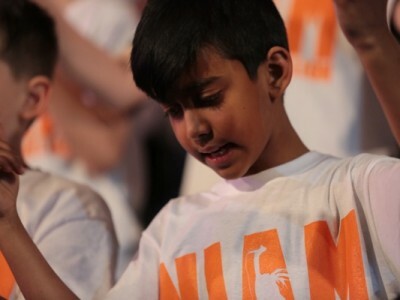 Our Annual Schools Arena Events, each involve around 5,000 to 6,000 schoolchildren of all ages, performing a set list of songs in the arena, as part of the VIAM Choir. 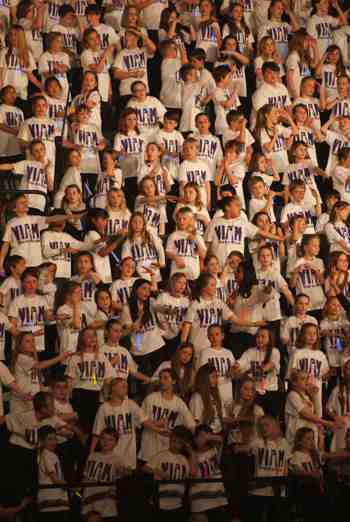 The School Choirs sit in either side of the arena in the tiered galleries. On Stage we also have a number of smaller choirs and selected soloists, that together form our stage choir. These sing the lead vocals and additional harmonies for each song in the set list. At our Theatre Events, we have between 300 and 500 children on stage. There is also an audience of between 5000 and 6,000, these are seated on the floor level of the arena. In theatres, our audience is generally between 750 and 1,000. Parents of all choir members are given the opportunity to buy their seats in advance of the event going on general sale to the public; If parents are not sure where their child’s group is placed in the choir gallery, they can select “best view of my school’ as a seating option and name their school. We will put them in the best available seat to see their child at the time of booking. Once a school registers, we send them access to all of the rehearsal materials, along with any documents they may need. There is a small charge for the rehearsal materials; as we supply music that has copyright involved and the fees cover all mechanical royalties to the copyright owners; and any royalties payable to the owners of the master recordings. The charge also covers the downloads of all the materials by all of the school choir members. We provide all the tools you need. Generally the school groups rehearse on a regular basis at school; and if you wish, we can arrange for one of our team to come along to the school to run a workshop of all the songs they need to learn. In advance of the event, we require names of every child taking part, to ensure they are entered correctly into the event programme; and in addition we will need the T shirt size of each child. We supply the school with all documentation to send out to parents etc, to make the job easy to administer. On the day of the event, the schools arrive early afternoon, and using the choir tickets provided they gain entry to the arena. At the entrance to their to their seating block within the arena, each group will be given their batch of T Shirts.. This is followed by a full scale rehearsal of the show, for the choir and all the technicians. We try and make this rehearsal as much of the overall experience for the children; as possible. We endeavour as much as possible to get a balance between the performance being a mass choir choral event and a staged production. This we have found creates the best experience not only for those watching but also those taking part, particularly the younger ones from Primary Schools. In addition, to enhance the experience even further, we are also offering schools that take part, the opportunity to join our stage choir on stage for one number. Places for these spots are taken fast as stage space is limited. 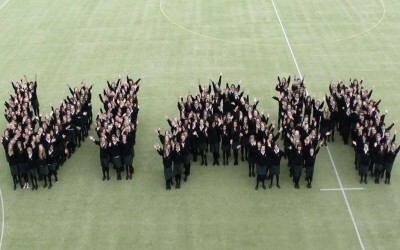 You can see videos of our previous event HERE; and see how much the children enjoy taking part. You can also read HERE from a Teacher or Parent’s point of view; about their VIAM experience; and what it meant to their children and pupils. If you wish to register your school or group for one of our next events, taking part is easy and involves a minimal amount of administration for the school. Many schools that don’t have choirs also participate with their pupils for a fun and educational experience. There is a £50.00 (plus VAT) charge to cover the cost of all the rehearsal materials necessary, inc licence and copyright fees. A minimum of 10 participants is the requirement for a group taking part. We require a minimum of one chaperone / teacher per 12 children. A member of VIAM staff will respond by email to confirm your booking and the details you have confirmed below. This secures your group’s place. The final payment is due once you have confirmed your total group’s number closer to the event. Upon receipt of those numbers we issue an invoice for the T Shirts for the entire group less the £125 paid for the initial purchase of 10 T Shirts. Please ensure you understand our terms before registering, If in doubt please call the office, or complete a general enquiry form. How do we sign up to take part ? Simply register your school with us, by pressing the red Button ‘Register Your School’ or selecting the link in the ‘Quick Links’. This will take you to the registration page. Complete your details and send us an approximate number of children taking part from your group. This number can be adjusted up or down, at any stage. We generally find that once the group starts rehearsing, the numbers of children wanting to join the group or choir starts increasing. We also offer a group workshop, where one of our team comes along to the school and workshops a full rehearsal, as well as talking to the children and parents about the choir and the event. Once registered, you will need to enter your teacher details in the members Login section on the top right of this page, to join us as a Teacher Member access to the rehearsal materials for your particular event. We will also email you with a welcome pack including forms to print and send to each of your parents. All details for the parent are included in the forms.The majority of our schools ask their Parent Teacher Association to assist in this. Teachers, Parents and all choir members taking part are given access on the website to all of the rehearsal materials to download. Select ‘Join Us’ and you will be directed to the pages for Teacher, Parent of Choir Member Access.